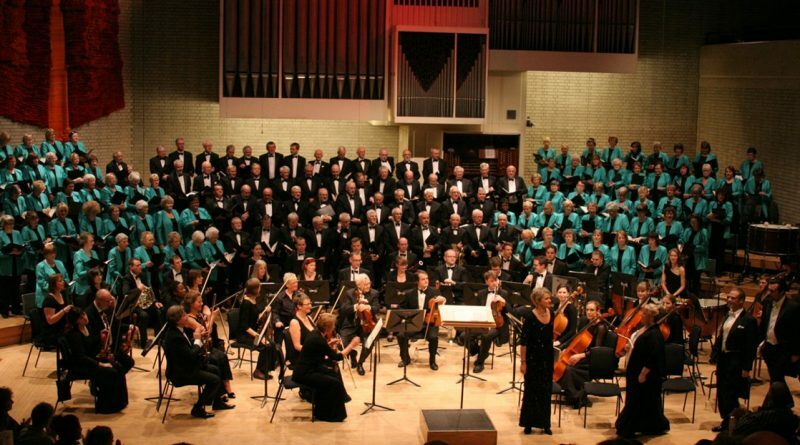 Oldham Choral Society, with about 130 members, is one of the leading amateur choirs in North West England. The repertoire includes most of the major choral works by Bach, Elgar, Handel, Haydn, Mendelssohn, Rossini and many others. The society organises about 4 concerts a year in Oldham, elsewhere in Manchester and further afield. Membership is open to anyone who wants to sing; we do not hold auditions. Rehearsals are held on Monday evenings at 7:20 pm in the main hall at the back of the first floor of Chadderton Town Hall, Middleton Rd, Chadderton OL9 6PP (see photo below). On Sunday April 28th at 7:00 pm in the Royal Northern College of Music we will be presenting Verdi’s Requiem. For further details click the title above. A primary purpose of this site is to encourage people to come and sing with us and to attend our concerts. Information about our next concert is on this page (see above) with a link to a more detailed page. The menu provides further information about the future programme. The site also provides an archive of what we have done in the past. You can see reports of most of the concerts we have done over the past ten years or so under “Past Concerts”. Under “Programmes” you can see almost all our programmes from the last century and more – a fascinating glimpse into the history of Oldham. There is also an account of the Society’s history and a repertoire list. Contact information is provided here.